Panic in november. No freezing. No snow. Ski resorts in full frantic. Xmass holidays are coming. Hyperventilation! But when people were losing all hope in climate, big fat “high pressure” momma left the continent and made way for northwesterly runs smashing in moisture into the Alps, providing 2m of snow by the time the turkeys were filled. Whew! Winter saved. Get the snow shoes of stable. Ready for some powder blues. With a winter traverse of arctic Sarek scheduled for end March, we wanted to do some more field tests of our winter gear: pulka, snow shoes, Therm-A-Rest NeoAir All-Season,… and yeah, testing the tarping business on stable winter conditions. Que? So on the last week of the diverse year 2011 we spent on the Western Alps’ finest balcony: the undulating Vercors. Set upon a limestone plateau in the Rhône-Alpes region of southeastern France, the Vercors plateau extends into the Western Alps, catching the first moisture before it hits the main ridges and high summits of the main Alps more to the west. Surrounded by high cliffs whatever the side you approach it, you will need to enter the plateau trough deep gorges or tight passes. The Vercors plateaus generally run north-south at around 1400m altitude, is rather woody (esp.pines, it reminds us a lot on northern Scandinavia) with intermediate vast, windswept spaces. It’s real danger however lies in the large network of karst cracks permeable to water making it a desert in summer and a “crevasse-hidden glacier” in winter. On the north side of the plateau, easy accesbile from the city of Grenoble, you will find some ski-stations, where it’s less interesting for the “wilderness”-hiker. To the south-east, the plateau is protected in the Parc Naturel Régional du Vercors, only dotted with some very basic shelters, providing some refuge for when it gets erratic on the plateau. And when nasty weather hits in, then it can howl badly, so come prepared, summer or winter! In winter it’s a paradise for snow shoeing, cross-country skiing and even pulling a pulk. No experience so far in summer, but water scarce seems to be the bottleneck in this season. Altough not as such use for short trips and especially if it is not too cold (like it was on the first night), we wanted to test the vapor barrier line technique in our sleeping bag. This was the winter sleeping set up, which worked only well when temperaturs reached -7°C and lower. One night it was barely freezing, and we were litteraly boiling eggs. Result, half way night we woke up in a puddle of sweat (collected in the VBL) and had to ditch the VBL and base layer. 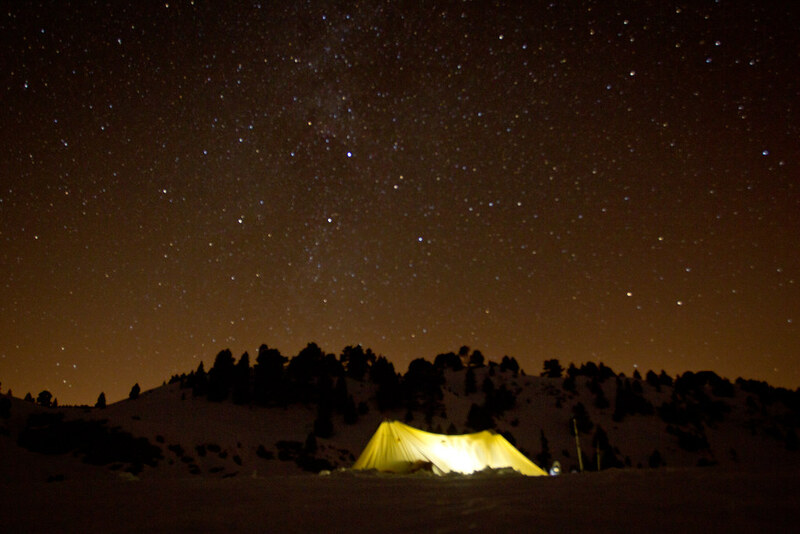 This will be our setup for Sarek, but we will bring along a heavy winter tent for frantic nights… to be continued. When you lay upon the matress, at first it will feel cold and the squeezing metallic sound of the inner fabric bothers you. After a couple of minutes the technology unfolds: the inside warmth reflection reliefs! How nice is that! On a surplus it’s more comfartable sleeping then the “hard” prolites. Are we happy with this quite light product: you bet yes! Before we forget: a happy new year to you all and thanx for passing by this blog. 2012 promises to be an adventurous year with loads of things coming up. We are especially and eagerly awaiting a new member of our family: the Alpacka unrigged explorer PACKRAFT! Our adventures will no longer be limited to mountains, fields and forrests, but will be extended onto open waters. So more coming up on that shortly! For more pictures from this trip, please visit our online album! 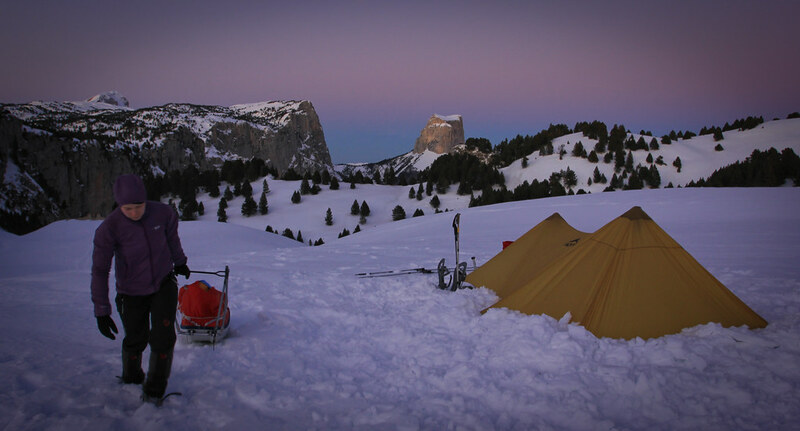 This entry was posted in Gear, Trip report and tagged alps, limestone plateau, mont aiguille, pulka, stars, tarp, vercors, western alps, winter. Bookmark the permalink. Hi S+K I have been in this area in the summer, what a transformation in the snow. Great video BTW. We are still waiting for some good snow here in England. I am still waiting to use my Kahtoola Mountain snow shoes . Such a difference from last year when I had used them quite a number of times by early January. Weather is miserable – wind and mild. Where are the cold crisp days ? What a great landscape. Video is great and snow shoes in the snow looks fun to do.